I always try to have a take home gift or special party favor at my parties. I found some cute small gold glittered Party Cracker Poppers and included them at each place setting. "Christmas Crackers" are my most favorite party favor. Everyone loves the "pop" and to wear the silly crepe paper hat, read the joke or riddle and keep the little prize in each one. 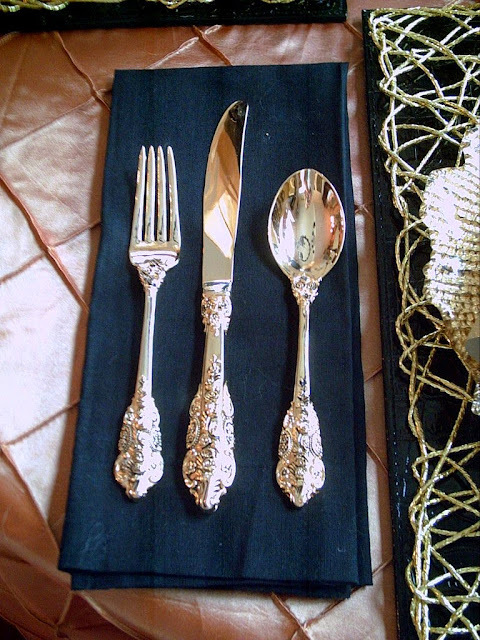 View of the complete Tablescape on a forty-eight inch table. Just perfect for 4 people. Close-up of the Urn that I used for supporting the centerpiece. Purchased at Hobby Lobby some time ago. 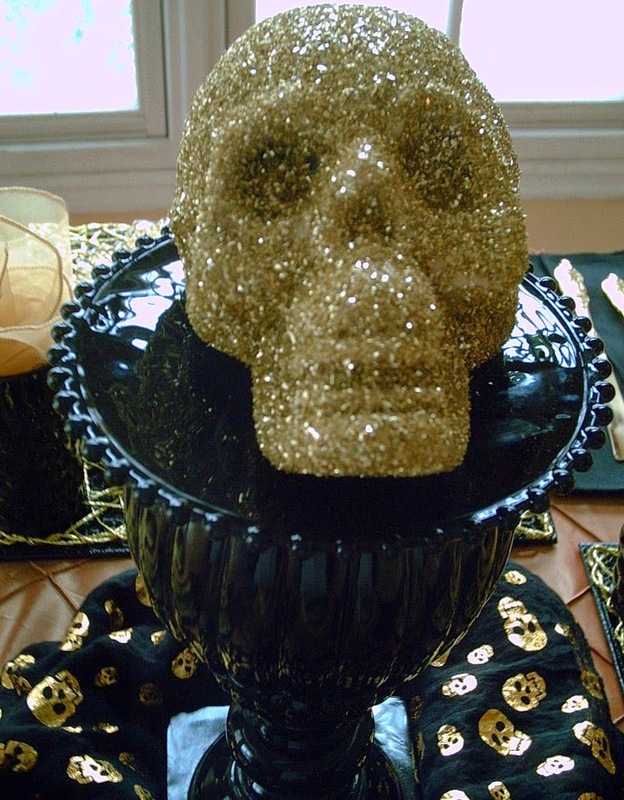 It has a jeweled lid, which I removed to put the golden skull on top. My favorite all-around black bubble glass. From the Martha Stewart line at Macy's. 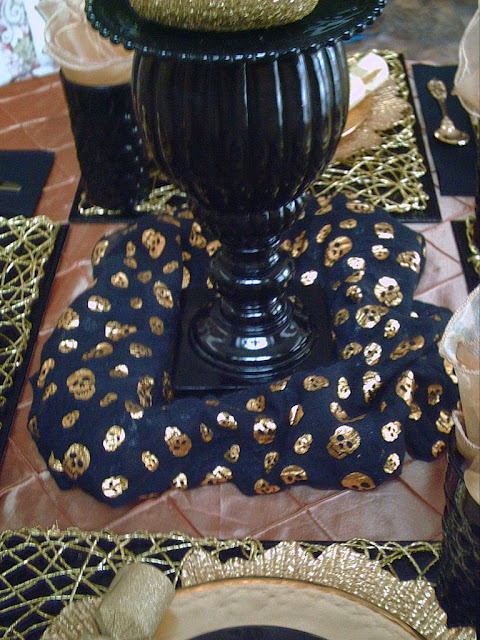 I used a black scarf with golden skulls as my scrunched up runner. 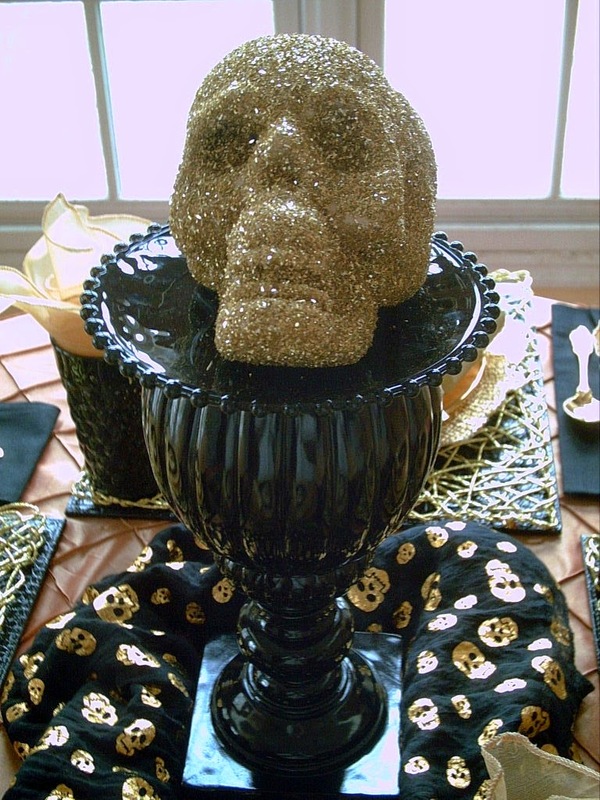 The urn from Hobby Lobby with a Martha Stewart black plate on top to hold the skull. Love, love, love this beautiful skull. He came from the dollar store. I bought several. Amazing what you can do with a dollar store item. Just a plain tan plastic skull. I brushed on Martha Stewart Glitter Glue with included brush. I used Golden German Glass Glitter and sprinkled it on. I really love the results. German glass glitter is so lovely. They have this glitter available in either the stained glass type glitter which is made from clear glass or they make it from silvered glass which is stunning, because no matter what color you get it in the color ages and acquires such a gorgeous patina over time. This glitter is more substantial and has such a depth and sparkle. Should not be used by children. This is my flatware purchased several years ago at a department store called Z.C.M.I. Now closed after many years in operation. Google to read about this department store. 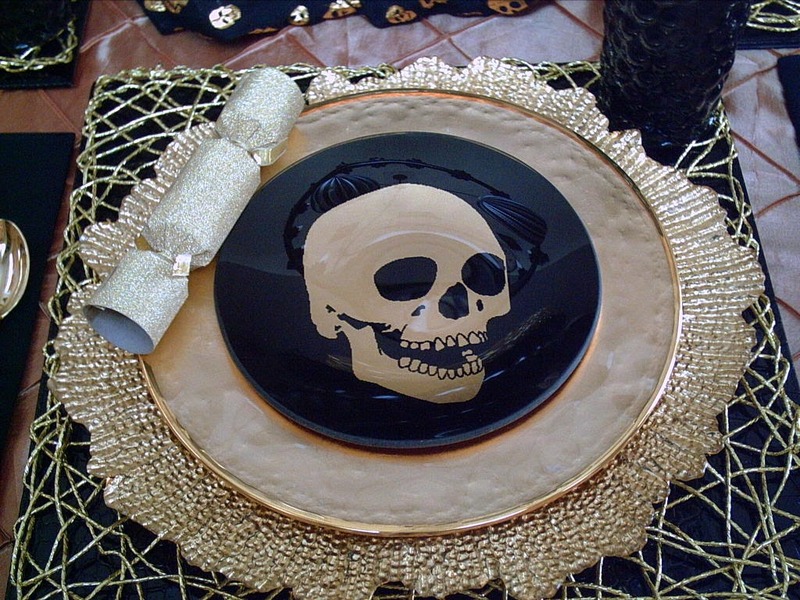 I saw this over on G+ and headed over to check out this tablescape! It is great! I would love it if you would stop by and share it at my Celebrate it Sunday Link Party! You can link up anytime before Friday, or wait a couple of weeks until we really get into Halloween! 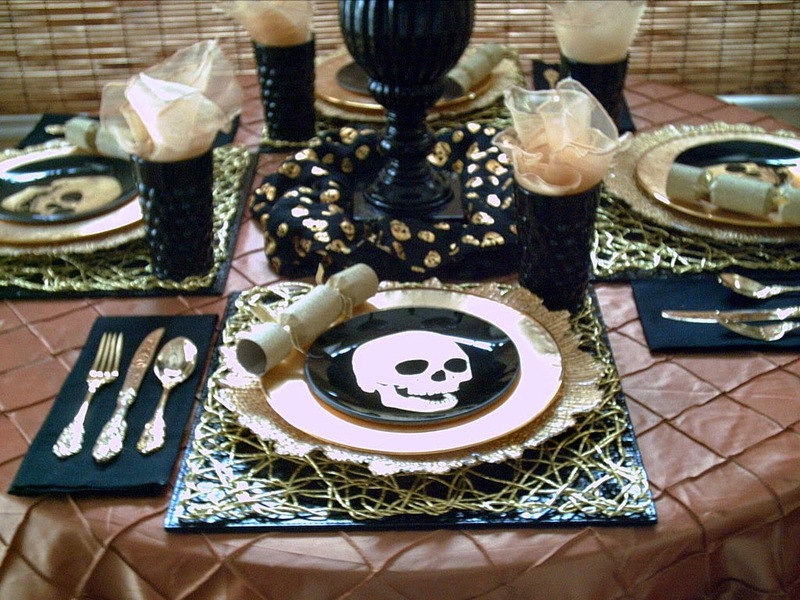 I will be sharing this and pinning, it is a fantastic tablescape for Halloween. You are right! I am already thinking about Halloween. I just love your plates. 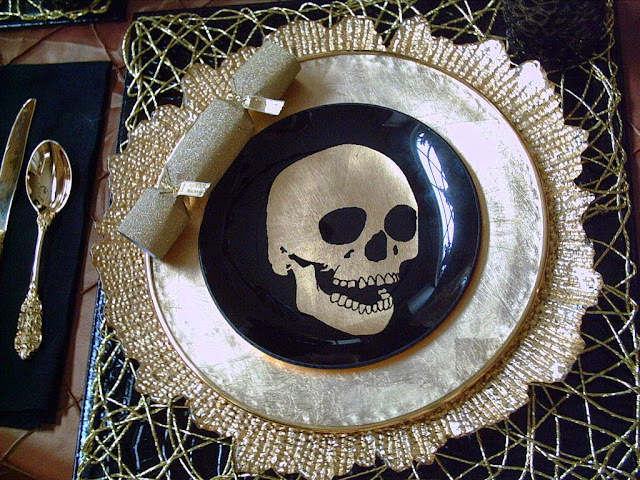 I keep telling myself that I won't buy any more holiday specific dinnerware but these are sure tempting me. I like all your little details. Now if it would just cool off, I would really believe we are getting closer to Halloween! What an amazing table and I love the skull plates, so unusual, I've never seen nothing like it. I love Halloween as is my birth month and so my mom in Astoria-NY, my hometown; used to make little Halloween parties for me any given day in Oct. as she knew I'd be Trick'o'treating the 31st. Every element in your setting is awesome too! I pinned it to my Halloween board on pinterest. Outstanding fun Valerie. I have those gold skull plates too. They are so elegant. Great job on putting everything together. 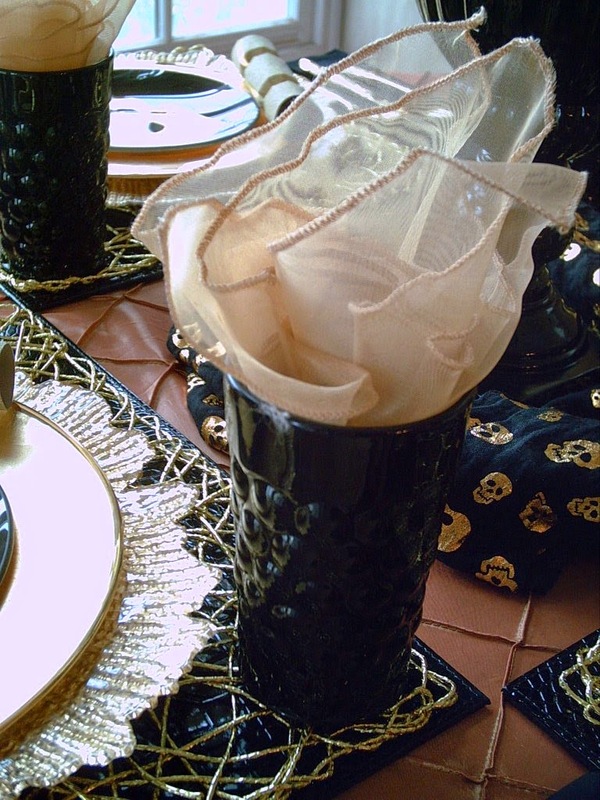 I love your Halloween table setting. Very well done.